Impress your friends with five fast facts about Agnes Martin (1912–2004), whose work is on view in Pathmakers: Women in Art, Craft, and Design, Midcentury and Today through February 28, 2016. 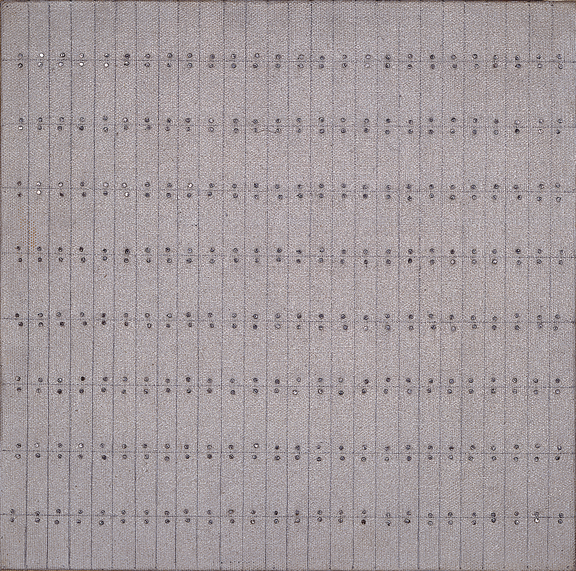 Agnes Martin started out as a descriptive artist, but she was not truly satisfied with her work until she discovered the grid. In her move to abstraction, her goal was to depict subtle emotions, such as those felt when experiencing the natural world, rather than nature itself. While living on Coenties Slip in New York City from 1957 to 1969, Martin was a neighbor of artists Lenore Tawney, Ann Wilson, Ellsworth Kelly, Robert Indiana, Jack Youngerman, Robert Rauschenberg, and Jasper Johns. In 1967, Martin “retired” from painting. 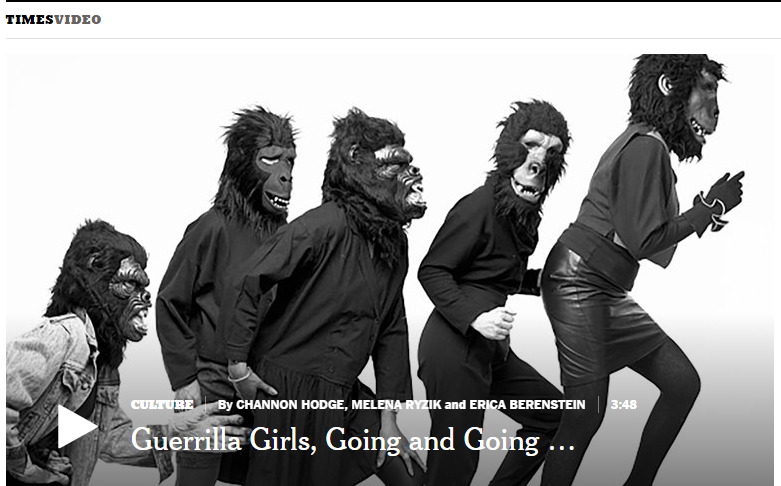 She left New York, then the center of the art world, and drove around the continent in her pickup truck and camper. When she resurfaced, she had left the grid behind, focusing instead on horizontal fields of limited color and tone. Celebrated as a visual artist, Martin also used the written word as a form of expression. Some of her notebooks combine the two art forms, with drawings on one page and poems opposite. In 1968, Martin settled on a mesa near Cuba, New Mexico, where she constructed buildings using native logs and adobe brick. For the next three decades, she lived a reclusive, solitary existence without electricity, plumbing, or a phone. 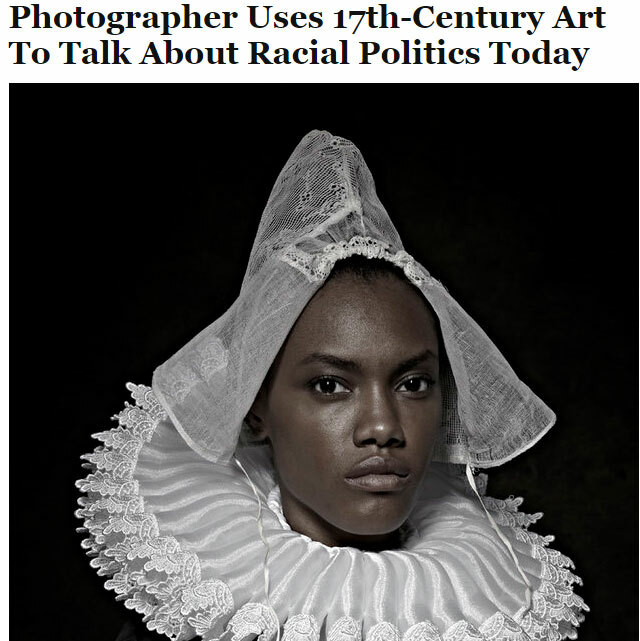 —Ashley Harris is assistant educator at the National Museum of Women in the Arts. The Wall #2 balances drawn grids with subtle washes of color. Martin’s signature compositions composed of measured grids are commonly associated with Minimalism, but the artist herself preferred the “Abstract Expressionist” label. The formal precision of her works belies their spiritual quality. 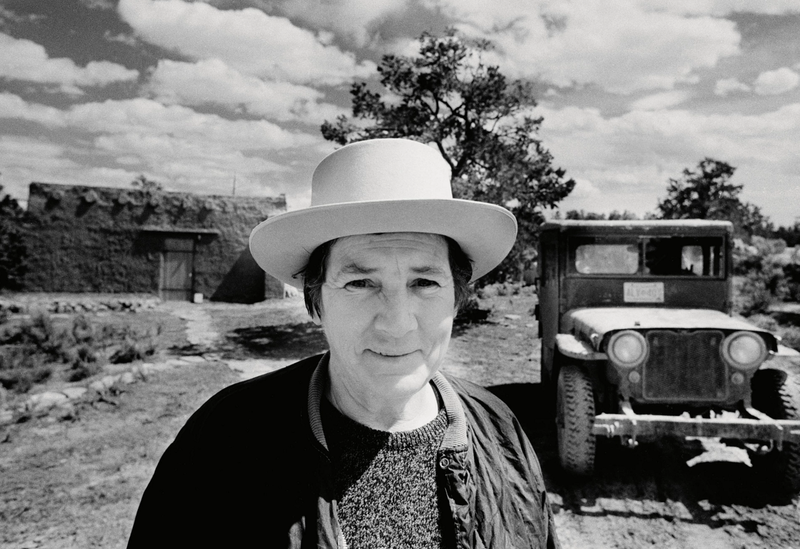 Born in Saskatchewan, Canada, Agnes Martin (b. 1912) is revered for her abstracted works. Though her paintings are based on a rational grid system, she imbued them with personal spiritual content. In 1967, Martin moved to New Mexico, where she lived in reclusion for three decades. Within that period she stopped painting for seven years. Martin stated, “The best things in life happen to you when you’re alone.” She began painting again in 1974, exhibiting a stylistic shift from pale shades to brighter hues. The Wall #2 exemplifies Martin’s spare aesthetic. Although meticulously placed, the small nails securing the canvas are marginally offset from one another, and the hand-drawn lines waver slightly. Visible handwork differentiates Martin from her hard-edged Minimalist contemporaries. The nails and lines generates a sense of stability—an almost hypnotic vibration of static elements. The steady rhythm of the dot-dash pattern of The Wall #2 instills a meditative sensibility that is representative of Martin’s oeuvre. 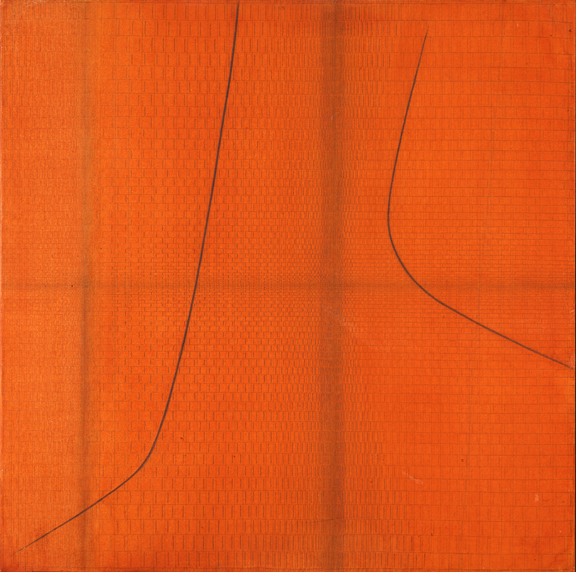 In NMWA’s collection, “Misure” Doppio Ritmo (“Measures” Double Rhythm) (1967) by Italian modernist Bice Lazzari is also based on precise, geometric lines. Colored with swaths of red-orange tempera paint, the composition is activated by two curved lines, which dance and dive across the canvas. The background of faint lines and tight boxes give “Misure” Doppio Ritmo an almost-reptilian surface texture. Lazzari was often inspired by decorative arts and musical notes. Like Martin’s work, Lazzari’s painting has a hand-drawn quality. —Sarah Mathiesen is the publications and communications/marketing intern at the National Museum of Women in the Arts.